Platform puzzlers seem like a dime-a-dozen these days, so to stand out in a crowded market you need a hook to draw in consumers who have an almost endless choice in this genre. Another Perspective by indie developer ShaunJS does just that. Set in a bleak, almost nihlistic backdrop you play as an unnamed protagonist who is searching for … something. To aid your new friend on this search you must guide him through a series of stages, finding keys and unlocking doors in this deceptively simple but incredibly enjoyable title. The draw to Another Perspective lies in the way you solve puzzles. When you arrive at a new stage there may be more than one of you already there. These copies of yourself are frozen in time, but you can switch freely between them to bring each one to life. Each version of the hero sees a different version of the stage, with different platforms and pitfalls, and navigating to your goal will require you to switch between the perspectives to make progress. When frozen in time a hero effectively becomes a stepping stone which the other hero can use to bridge the gap between platforms. 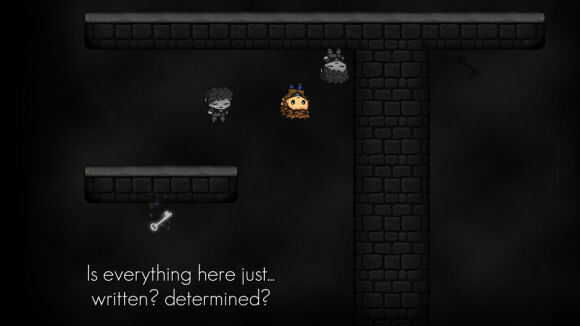 For example, an early level of the game puts a key on a ledge too far away to jump to, but by throwing one hero into the middle of the pit and switching perspectives you can now leap across to collect the key and proceed. 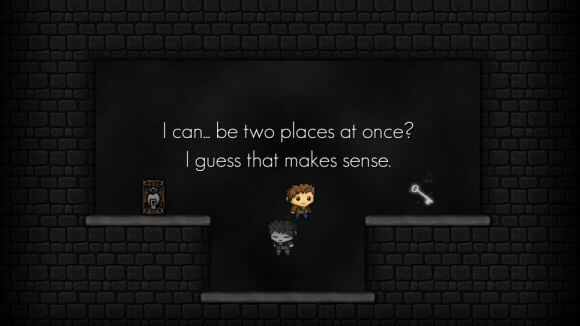 The game is very easy to pick up and quickly feels intuitive, and while the mechanic is very simple the game can be deliciously difficult, especially as it adds new challenges such as multiple keys to open a single door, obstacles that appear and disappear when keys are obtained and upside down heroes who fall up. You will be required to think critically about how to obtain keys and get to the door and some seemingly easy levels will require a well thought out strategy to get you to your goal without getting stuck or dropping one of your heroes to their doom. Dying resets the level, which you can also do yourself by hitting the R key, and each level is succinct enough that you won’t feel like you’ve lost a lot of progress by making an errant jump. While many of the levels are very challenging, they can all be figured out through playful trial-and-error. Even on the most difficult stages I never felt frustrated, merely challenged which makes arriving at the end of a difficult section very satisfying. My only real issue with the game is its length. I completed the whole thing in about thirty minutes and loved all of it, but at the end I still wanted more. While the game can be purchased for only $5 USD (Or £3.10) the experience still feels a little light at that price. While the game can be replayed, once you’ve figure out the puzzles one time they’re not much of challenge the second. This issue isn’t enough to ruin the experience, as I still heartily recommend Another Perspective, it’s just a minor gripe I had while playing an otherwise fantastic game. Hands down, Another Perspective is a great title with a great hook. For me it was the perfect blend of simple but not bland, challenging yet not frustrating. It may run a little short but it’s loads of fun while it lasts. Another Perspective can be purchased at ShaunJS’ site here.